Thanks to a new-and-improved CMOS contact image sensor, color documents can be scanned just as quickly as those in black and white and grayscale. The DR-2510C scanner offers a top speed of up to 25 ppm (50 ipm*) and Ultrasonic Double-Feed detection function, and the DR-2010C model achieves up to 20 ppm (40 ipm). Equipped with Automatic Color Detection for easy scanning of mixed batches, the DR-2510C and DR-2010C devices also feature efficiency-boosting image processing functions such as Automatic Page Size Detection, Skip Blank Page, Deskew, Text Orientation Recognition, and much more. Fine lines and intricate image details are captured with utmost precision and clarity thanks to Canon’s advanced scanner technologies. The 3-Dimensional Color Correction offers pinpoint color matching to produce images that are true to the original and free of unwanted color staining. Bundled with the latest document imaging software packages—CapturePerfect 3.0, Nuance eCopy PDF Pro Office, PaperPort standard, OmniPage 4SE, and Presto! BizCard 5 SE—the Canon DR-2510C device is more than just a scanner. You‘ll soon find that your small investment will enhance your office productivity many times over. The small footprint and versatile tray design of the Canon DR-2510C and DR-2010C scanners make them ideal for use on desktops and countertops or anywhere there are tight spaces. The three-way design allows scanners to be used with the built-in eject tray closed, opened, or half-opened with stopper to suit your workspace. 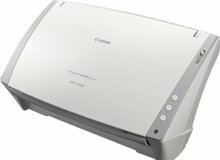 Canon’s DR-2510C and DR-2010C scanners are also incredibly easy to use. Simply assign routine scanning tasks to customizable Scan-To-Job buttons for one-touch operations such as Scan-To-E-mail and Scan-To-Print, including all the relevant scanner settings. The new slanted paper path design of the DR-2510C and DR-2010C scanners guarantees smooth scanning of a wide variety of documents, from thick documents and multi-sheet forms, to driver licenses and even embossed plastic cards. And Canon’s innovative feeding mechanism with its retard rollers will ensure reliable page separation for fast, unattended batch scanning.